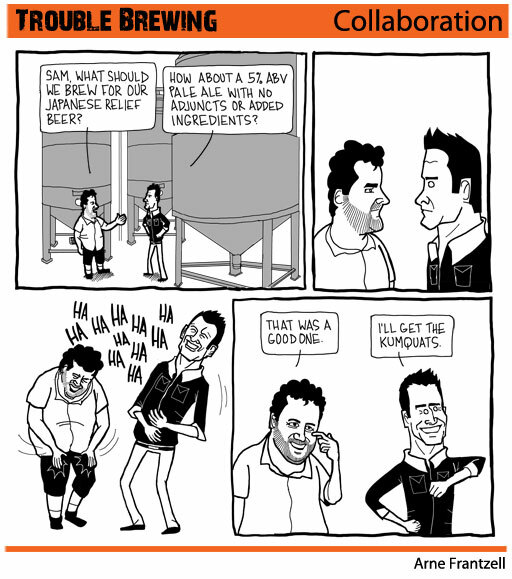 From time to time, I find my way back over to The Full Pint to check out their weekly comic entitled Trouble Brewing, which regularly pokes fun at the craft beer world. In a previous post, we shared a few installments that featured Patrick Rue of The Bruery. 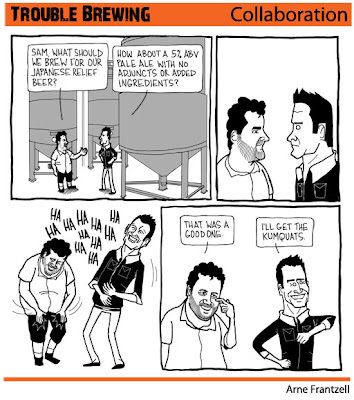 Below is another that features Patrick and Sam Calagione of Dogfish Head. If you don't get it, go take a look at the beer lineup from Dogfish or the recipes they discuss on the TV show: Brew Masters. You can find the entire collection of Trouble Brewing (both the good ones and the .... not so good ones) over at the Full Pint. Got a link to some other good beer related comics or art? Let us know! "I'm going to drink till I reboot!"